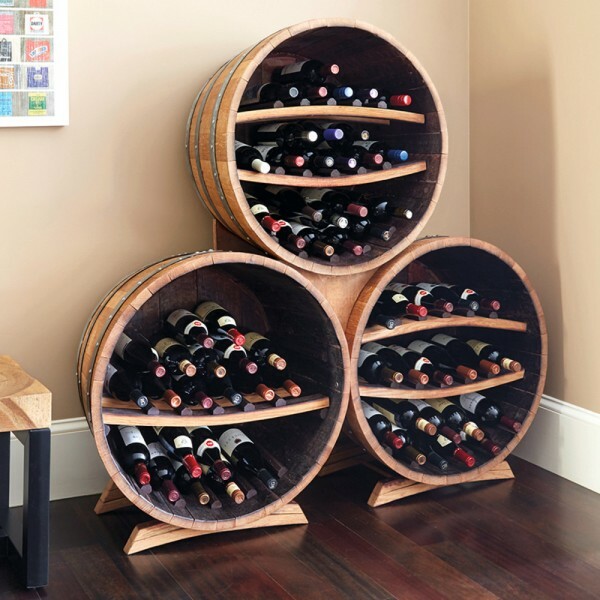 Half Barrel Bottle Racks Triple Stack (P/N 17449). Hand-made in the USA from reclained oak wine barrels, these gorgeous wine racks include all of the historical branding and vineyard markings from their original service. The set includes 3 racks, each with 2 notched shelves that are removable for additional storage capacity. Using 1 shelf, each rack holds up to 32 bottles, and using 2 shelves, each rack holds up to 27 bottles. Also sold as a single rack. (Item #17448). Includes 3 half barrel racks, 6 shelves 2 floor stands and 1 stacking stand.